The Stirling engine, invented in 1816 by a Scottish clergyman and practically dormant for decades, is undergoing a revival, largely on the strength of its low pollution level and the small percentage of input heat discharged as exhaust. Multi-cylinder Stirling engines have only two moving parts per cylinder, and energy efficiency can be high. 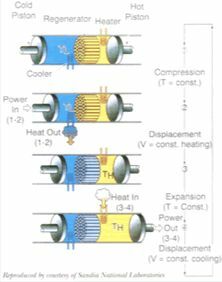 Although the principle of operation appears simple (see illustration), successful design relies on achievement of a fine balance between two conflicting phenomena – heat transfer and flow loss. The key component is the regenerator – an innocent- looking stack of stainless steel gauzes woven from wire as fine as human hair. The regenerator problem or ‘conjugate heat transfer problem’ was identified in the 1920s. Despite onslaughts from such well-known figures as Hausen and Nusselt, it remained unsolved until Dr Allan Organ reformulated it in Lagrange coordinates and in terms of temperature difference. Pages of daunting algebra gave way to a few lines. How the Stirling engine works. Stirling engines in current use are largely the result of trial and error development, an expensive business which Dr Organ’s theoretical work aims to reduce. ‘Stirling engines are undergoing trials in submarines,’ he says, ‘and are reversible in the sense that they can function as heat pumps and refrigerators – CFC-free, of course! The Stirling engine for the Mileage Marathon vehicle. Dr Organ temporarily put aside building Stirling engines to focus on the regenerator problem. The solution applies to the rotary generators of gas turbines for vehicle propulsion, and is being reduced to chart form for a regenerator design manual due for publication by the Institution of Mechanical Engineers. He then wants to go back to building engines. ‘Building things is what engineering is about. Until you are putting bits and pieces together you have not designed anything!’ As a start, he has students designing and making a lightweight, Stirling-powered vehicle for entry in the Shell Mileage Marathon. The current record stands at some 7,600 miles per gallon. Beating that will be quite a challenge.